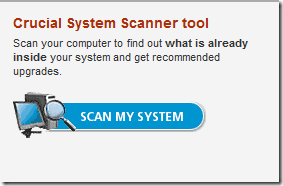 Go to www.crucial.com/uk and run their Memory Scanner. It will tell you what you can upgrade to, and you can purchase RAM chips from from them. They will post free of charge, and the RAM should arrive in 2-3 days. On an older laptop you would expect to have have 256mb or 512mb of existing RAM, and you should be aiming for about 2gb (the maximum amount of RAM Windows XP can use is about 3.5 gb). On many laptops RAM can be fitted by removing a plate on the underside of the laptop, but sometimes one of the chips is below the keyboard – and this is usually a bit of an excavation. Fitting RAM to a PC is quite easy. 1. Make sure that you are working in a static-safe environment. Remove any plastic bags or papers from your work space. 2. Turn your computer power button off, and then unplug the power cord. For notebooks, remove the battery. 3. Discharge residual power by pressing the power button again. 4. 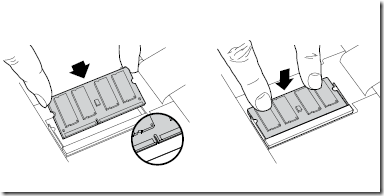 Refer to your computer manual when removing the computer cover. 6. Locate your computer’s memory expansion slots (consult your computer manual). 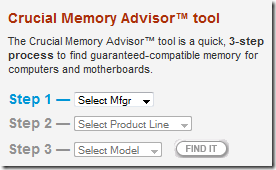 Do not use any tools in the removal or installation of memory modules. 7. Insert your memory upgrade according to the illustrations in this guide. Align the notch(es) on the module with the notch(es) in the slot, and then press down until the clips on the slot snap into place. (It can take 20 to 30 pounds of pressure to install a module.) Fill your slots starting with the largest density (put the largest module in bank 0). 8. Once the module(s) have been installed, replace the computer cover and reconnect the power cord or battery. 1. If you receive an error message or hear a series of beeps, your system may not be recognizing the new memory. Remove and reinstall the modules to ensure they are securely seated in the sockets. 2. If your system won’t boot, check all of the connections inside your computer. It is easy to bump a cable and pull it out of its connector, disabling devices such as your hard drive or CD-ROM. If your system still won’t reboot, contact Crucial Technical Support. 3. When restarting your system, you may get a message prompting you to update the configuration settings. Refer to your computer manual for information. If you are still unsure, please call Crucial Technical Support for assistance. 1. Your module doesn’t seem to fit; do not force it into the socket. 2. Your system is recognizing only half of the new module’s memory. Using firm, even pressure, push DIMM into socket until clips snap into place. Do not assist clips. Firmly push SODIMM in at 45° angle, and then push down until clips snap into place. How do I open a docx email attachment?